X It loves to eat leaves. If it is attacked by a Starly, it will defend itself with its spiked rear. X Es isst am liebsten Blätter. Wird es von einem Staralili angegriffen, verteidigt es sich mit Stacheln. X Il adore manger des feuilles. Si un Étourmi l’attaque, il riposte avec les piquants de son postérieur. X Le encanta comer hojas. Si le ataca un Starly, se defenderá con sus púas. X Ama mangiare le foglie. Se Starly lo attacca, si difende con gli aculei che ha sulla parte posteriore. X 잎사귀를 매우 좋아한다. 찌르꼬에게 습격당했을 때는 엉덩이의 가시로 물리친다. Y It lives among the tall grass and in forests. It repels attacks by raising up the spikes on its rear. Y Es haust in Wäldern und auf Wiesen. Bei Angriffen wehrt es sich mit den Giftstacheln auf seinem Hinterteil. Y Il habite les forêts et les hautes herbes. Attaqué, il riposte avec les piquants de son postérieur. Y Vive en bosques y zonas de hierba alta. Si le atacan, se defiende con las púas venenosas de su cola. Y Vive nelle foreste e tra l’erba alta. Se è attaccato, usa gli aculei velenosi che ha sulla parte posteriore. Y 숲과 수풀에 서식한다. 적에게 습격당했을 때는 엉덩이의 독가시로 대항한다. Omega Ruby Wurmple is targeted by Swellow as prey. This Pokémon will try to resist by pointing the spikes on its rear at the attacking predator. It will weaken the foe by leaking poison from the spikes. Omega Ruby Waumpel wird von Schwalboss als Beute angesehen. Dieses Pokémon wehrt sich gegen angreifende Räuber, indem es die Stacheln an seinem Hinterteil auf sie richtet. Es schwächt seine Gegner mit dem Gift, das aus den Stacheln austritt. Omega Ruby Chenipotte est la proie de Hélédelle. Ce Pokémon essaie de résister en dirigeant les pointes de son dos vers le prédateur. Il affaiblit son ennemi en lui injectant du poison. 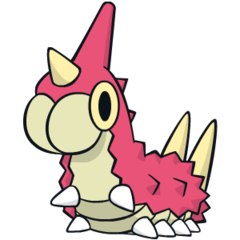 Omega Ruby Wurmple es la presa preferida de Swellow. La forma que tiene de intentar defenderse es apuntar con las púas del lomo al amenazante enemigo y debilitarlo inyectándole veneno. Omega Ruby Wurmple è la preda favorita di Swellow. Questo Pokémon cerca di resistere puntando gli aculei irti sulla schiena contro il predatore che attacca. Poi indebolisce il nemico emettendo veleno da questi aculei. Omega Ruby 먹이로 삼으려고 다가온 스왈로에게 엉덩이의 가시를 들이밀고 저항한다. 배어 나온 독으로 상대를 약하게 만든다. Alpha Sapphire Using the spikes on its rear end, Wurmple peels the bark off trees and feeds on the sap that oozes out. This Pokémon’s feet are tipped with suction pads that allow it to cling to glass without slipping. Alpha Sapphire Waumpel kann mit den Stacheln an seinem Hinterteil die Rinde von Bäumen entfernen und ernährt sich von dem austretenden Saft. An den Füßen dieses Pokémon befinden sich Saugnäpfe, mit denen es auch an Glas nicht abrutscht. Alpha Sapphire À l’aide de ses pointes arrière, Chenipotte déchire l’écorce des arbres et mange la sève qui coule dessus. Les pattes de ce Pokémon sont dotées de coussinets à ventouses pour adhérer aux parois en verre sans en glisser. Alpha Sapphire Wurmple usa las púas del lomo para raspar los troncos de los árboles, quitarles la corteza y beber la savia que emanan. Este Pokémon tiene unas ventosas rematándole los pies, con las que se adhiere al cristal sin resbalarse. Alpha Sapphire Grazie agli aculei sulla parte posteriore del corpo, Wurmple scorteccia i tronchi degli alberi e si nutre della loro linfa. Le sue zampe sono dotate di ventose che gli consentono di attaccarsi ai vetri senza scivolare. Alpha Sapphire 엉덩이의 가시로 나무의 껍질을 벗기고 배어 나온 수액을 식량으로 삼는다. 흡반이 달린 다리는 유리에서도 미끄러지지 않는다. 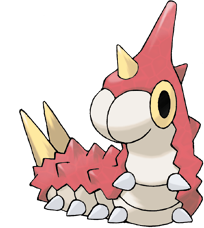 Ruby Using the spikes on its rear end, Wurmple peels the bark off trees and feeds on the sap that oozes out. This Pokemon's feet are tipped with suction pads that allow it to cling to glass without slipping. Sapphire WURMPLE is targeted by SWELLOW as prey. This POKeMON will try to resist by pointing the spikes on its rear at the attacking predator. It will weaken the foe by leaking poison from the spikes. LeafGreen It lives amidst tall grass and in forests. When attacked, it resists by pointing its venomous spikes at the foe. Diamond It loves to eat leaves. If it is attacked by a STARLY, it will defend itself with its spiked rear. Pearl It spits a white silk that turns sticky when it contacts air. It is used to immobilize foes. Platinum Often targeted by bird Pokemon, it desperately resists by releasing poison from its tail spikes. SoulSilver It lives among the tall grass and in forests. It repels attacks by raising up the spikes on its rear. Black Often targeted by bird Pokémon, it desperately resists by releasing poison from its tail spikes. White Often targeted by bird Pokémon, it desperately resists by releasing poison from its tail spikes. Black 2 Often targeted by bird Pokémon, it desperately resists by releasing poison from its tail spikes. White 2 Often targeted by bird Pokémon, it desperately resists by releasing poison from its tail spikes.